October 19, 2009, Fort Collins, Colo. – It was reported last Thursday that a 6 year old little boy, Falcon from Colorado had accidentally taken flight in a helium balloon that his father was working on in their backyard. The report indicated that while the parents were inside their home, Falcon was paying in the backyard and somehow got into his father's homemade balloon. Somehow the balloon became unanchored and then took flight across Colorado’s countryside. It now appears that the story that was given to the police and the news media was a hoax contrived by the parents and others to land a reality television show, authorities said on Sunday. On Thursday as TV viewers from around the world watched in fear hoping that the outcome would not turn to tragedy, authorities reported the pan shaped balloon silver in color, was 20 feet long and five feet high drifted across the countryside for more than 90 minutes and at one point reached an altitude of 9,000 feet. The Colorado Air National Guard had deployed a UH 60 Black Hawk helicopter, and had a second UH 60 Black Hawk helicopter on standby equipped with night vision. The balloon soon came to a soft landing. The 6 year old was not in the balloon. 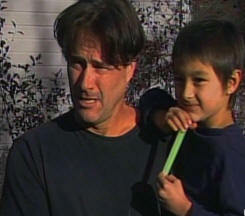 Reporters began asking the family questions about the child’s whereabouts during the time the balloon was in flight. There was wide speculation that some of this information given by the family just was not adding up. In addition it was reported that the parents, Richard and Mayumi Heene, were featured on the 100th episode of ABC's prime-time program "Wife Swap" in March 2009, and that the father was a storm chaser. Information began airing on national news that at the time the balloon was in flight the little boy had hid in the family’s home attic. "I played with my toys and took a nap," Falcon told reporters outside his home. "He says he was hiding in the attic," said Falcon's father as he clutched his son in his arms. The father further stated the boy’s actions were a result of "He says it's because I yelled at him." "I'm sorry I yelled at him," tearfully hugging the boy. Later in the day in an interview with CNN's "Larry King Live", filling in was Wolf Blitzer, Falcon reported he heard his parents calling for him from the garage. This raised a red flag as it was reported that the 6 year old was in the attic. The father then asked his son on the air why he didn't respond, the boy replied, "You guys said we did this for the show." Wolf Blitzer then asked the father what his son meant by that, the father became noticeably uncomfortable. He replied and stated he was "appalled" by the questions, and then adding that Falcon was likely referring to all the media coverage. A Colorado State University physics professor Brian Jones reported the balloon which was held together with duct tape would not have been able to launch with the 37-pound-boy inside. On Sunday authorities reported the parents and others in the media outlets had planned this hoax with the hopes of establishing a lucrative reality show. Emails are surfacing showing that a media outlet has agreed to pay money to the Heenes with regards to the balloon incident. The parents have not been arrest as of yet. However, it is expected both parents will face charges of conspiracy, contributing to the delinquency of a minor, making a false report to authorities and attempting to influence a public servant and may face federal charges.